Also, feel free to get creative with this simple recipe. It’s a great way to use up your leftover chicken or turkey meat, but you can totally jazz it up. Add your favorite herbs and seasonings – I usually make it with whatever strikes me that particular day, whether it’s parsley, herbes de provence, sage, thyme, savory, poultry seasoning, Montreal chicken seasoning, garlic, onions, Greek seasoning, or – my favorite – a blend of dried Tuscan seasoning. And you can add whatever veggies you happen to have on hand – although using a frozen veggie mix is awfully convenient! Pour the chicken broth and water into a large, heavy saucepan. Season the broth with onion, garlic, and ground pepper. Bring to a simmer over medium heat. Meanwhile, in a medium bowl, combine the Bisquick and the Tuscan seasoning. 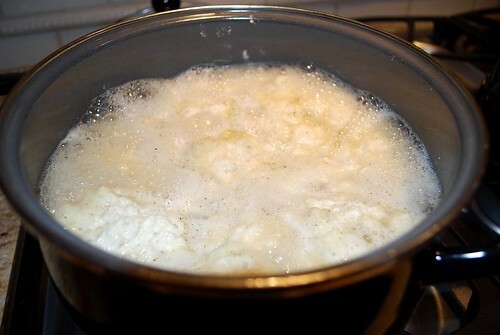 Add the milk, stirring lightly just until a soft dough forms. 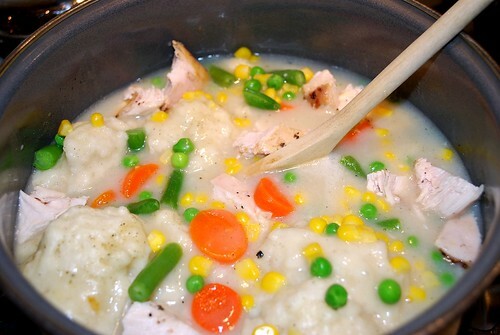 Drop the dough by rounded spoonfuls into t he simmering broth. 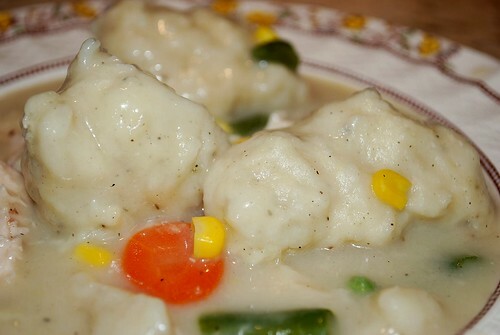 Allow the dumplings to simmer uncovered for 10 minutes. Then, cover your pot and allow to simmer for another 10 minutes. Cook mixed veggies according to package instructions (usually just microwave or steam for a few minutes). 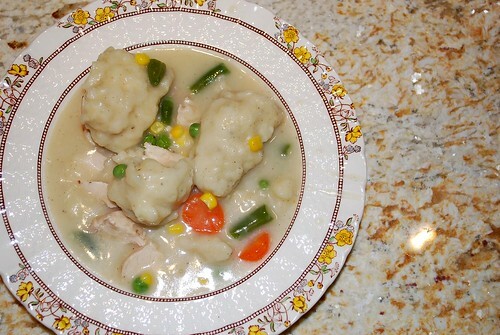 When dumplings have finished simmering, pour in your mixed veggies and your chicken or turkey and stir together lightly. Allow the mixture to return to a good simmer, and serve while it’s nice and hot!